guaranteed customer support and a 1-year warranty. To adjust the color settings on the LUX H8 V5 there are 4 switches on the bottom of the power supply with a label next to it with the associated color. Simply adjust the position of the switches and the intensity of the white and blue LED’s will result in a new color. Please note that the bottom 4 color settings (7,800K – 12,000K) are for Off-Road Use Only due to the blue hue of the light. Last edited by LuxAngelEyes; 07-01-2016 at 08:25 AM. Last edited by LuxAngelEyes; 12-01-2014 at 02:13 PM. Yeah. What is the side by side comparison? I know I just purchased my v4, but if there is a significant difference I might just have to buy the v5. I am just here to help! We do not yet have a side by side comparison of the lights but we are working on that. The LUX H8 V4 lights were rated at a 80 W halogen equivalent producing 850 lumen per side. the LUX H8 V5 lights are rated at a 120W equivalent producing 1200 lumen per side. The stock bulbs are rated at 35 watt each, 70 watt total. 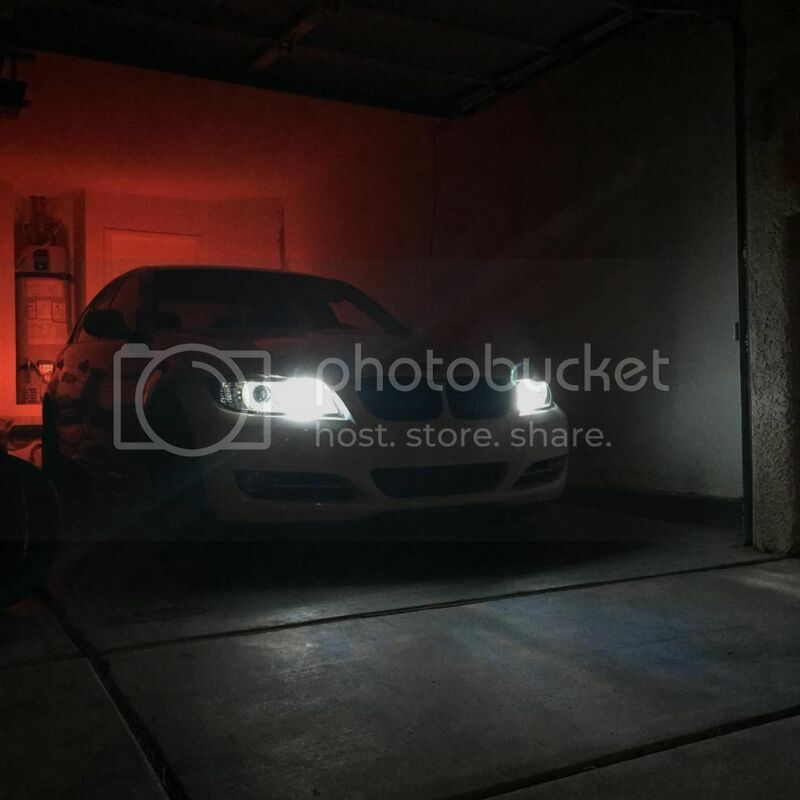 Our LUX H8 V5 lights are 1.7 times brighter then the stock bulbs in the daytime and about 3x as bright when the headlights are on. All LUX Products come with our guaranteed customer support and a 1-year warranty. So forgive me if I sound skeptical, but I do wonder though how come as a manufacturer, the first thing you didn't do was put the V4's in a car side by side with the V5's and take pics... When you obviously have them both in stock. Basic part of the R&D you would have done I'm sure before deciding to sell them - ensuring that they vastly outperform - to the human eye - the V4's. So why not share that info? So forgive me if I sound skeptical, but I do wonder though how come as a manufacturer, the first thing you didn't do was put the V4's in a car side by side and take pics... When you obviously have them both in stock. Basic part of the R&D you would have done I'm sure before releasing deciding to sell them - ensuring they vastly outperform to the human eye, the V4's. So why not share that info? Sure i understand all of your points. There was no reason in particular that we never released the Wattage equivalent of the V4's other than we never deemed it that important. Since other resellers starting to advertise their lights as a the #'s of W's we decided it was relevant to start providing true and accurate ratings of our lights. As for pictures, I personally don't have a coupe so its a bit difficult to line up a car that's local to get good pictures. We are working on getting something scheduled however with someone to get these Photo's. Appreciate the reply. Many of your buyers as you would have seen from the last round, sold their existing V3 sets to get V4's, so it would have seemed like a great marketing move to have that info upfront when you go to sell your V5's... Your business and it's your call of course. I just don't see how you couldn't find a single person with one of the 11 BMW models and years it fits during your R&D period to test them out in their car at your shop. But more importantly, wouldn't you want to know how it looks installed in a car and that it doesn't melt stuff, etc. before selling them??? Are the outer rings still dim like the v4's? I sold my v4's because the lumination in the outer rings were almost non-existent. Please advise. I'm not sure how I feel about laying out $225 for the V4, only to see V5 come out less than 30 days later. Are you offering a trade-up option? I'm curious as well, though as most vendors have said over the years (and if you take a look yourself), the main issue is the design of the rings, where the source light is placed on the inside ring, and therefore, by the time it travels to the outside ring, it dims quite a bit. That can't be solved by just throwing more light at it. I'm in the same boat with the V4. My V4 has been installed for about a week. Hoping there is a trade-in option. One major thing to keep in mind is that you cant overcome the design of the rings. The outer ring has small grooves behind the ring and these grooves reflect the light outwards. 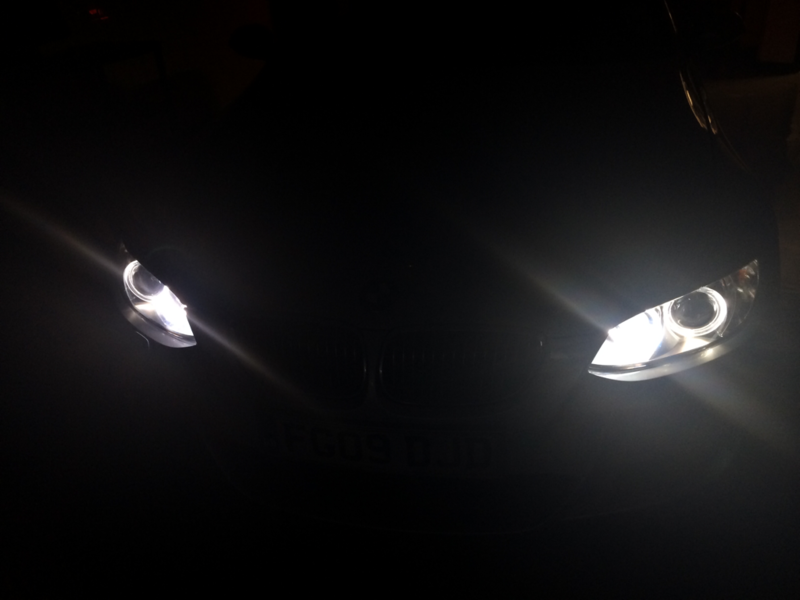 At certain angles the grooves are not visible as you can see in the 1st picture of this stock headlight below. From an angle the grooves are not visible so you will not see any light. What i always recommend to people is to step back from the car 30 feet and look at the lights straight on and around eye level with the headlights. From there you will be able to see the rings fully. The 2nd picture here is taken from 30-40 feet back and is a comparison of the stock bulbs vs LUX H8 V5 around 6900K. The picture has not been Photoshopped to change the rings at all and is exactly the way the looked in person as well. Last edited by LuxAngelEyes; 11-30-2014 at 07:56 PM. Last edited by LuxAngelEyes; 01-27-2015 at 06:48 PM. When will next batch of orders ship? Can't wait to get mine!! Ordered it 1AM EST hopefully they shipped today!! Last edited by DSCPLN; 12-01-2014 at 06:19 PM.